PowerShell: 2011 Scripting Games are almost uppon us! The 2011 Scripting Games are almost upon us, and I for one am very excited. There will be some modifications made to the games this year. For one this will be the first year that the games will only be in one language. This was done for several resons, but they all boil down to one…. There is simply no reason to not be using PowerShell at this point! As a reformed VBScritper I for one welcome the change. Another modification is that you will only be allowed to enter in one catagory. There was some heart ache last year, because I participated in every event. This raised the bar so that anyone who wanted to win would have had to produce 20 scripts in 14 days. The other side of the coin was that I was unfairly entering scripts that a true beginer shouldn’t have to compeate against. Both are valid points, and in hind site perhaps entering in both catagories was a poor choice on my behalf. That said, I welcome only participating in a single catagory, as delivering two high quality scripts per day for two weeks was a daunting task, and I was burned out after two weeks. Another potentialy game changing modification is that the submitions may not be visiable until after the deadline for a given challenge. Again I welcome this change as last years games only had one or two original solutions per event. By making the submitions private until after the deadline every solution will be original. This change by it’s very nature will enable cleaver, and uniqe approaches to a problem. I don’t think cheeting was a problem last year, but instead if you saw a script that used a rare .net object, and that script got 5 starts…. well doesn’t that influence you to use the same rare .net object yourself? Of coarse it does, it’s only human nature to want to deliver the best solution possible. At the end of the day whether your new to scripting or a seasoned pro I highly encourage you to participate in the games this year. I for one will attempt to defend my title, but there will be stiff competition, and I will be shocked if I can pull off a back to back championship. Oh yeah, and did I mention first prize will land you a free pass to TechEd Atlanta! Recently I was asked to do a guest post on the illustrious “Hey, Scripting Guy!” blog. I was very happy, and excited by this opportunity, but didn’t know what to write. I kicked it around for a couple days, and still nothing. So I called an old friend and asked him what his pain points were. He informed me that his shop was now operating under a 24×7 operations cycle, and it was impossible to keep his 3000+ workstations patched. With that I had my topic; having worked in these environments before I was acutely aware of the strain they put on the sysadmin to stay compliant. A couple days later I had compiled all the best techniques for detecting if a user was active on his/her PC, and shipped my draft off the scripting guy. This morning Google reader greeted me with my very own post! Thanks to the Scripting Guy again for this awesome opportunity and I hope you enjoy the post! I’ve had the pleasure of spending the last several days talking to the development team here at NetApp about the DataONTAP PowerShell Toolkit. As a result we’ve all learned alot, one of the more interesting features they brought to my attention was the credential management solution included with the toolkit. I found this very compelling, you see embedding credentials within a script is as old as scripting itself. There was a time not too long ago when it was considered taboo. However with PowerShell came access to the .net Security.Cryptography encryption/decryption methods. Scripters have unknowingly been accessing said methods indirectly whenever they would use the credential management funcions that Hal amd BSonPosh wrote long ago. Which brings me to the DataONTAP toolkit. The Development team has steped it up a notch and included a full credential management solution with the latest version of the toolkit. The way it works is first you need to save logon information by using the Add-NaCredential cmdlet to save the credentials for a given NetApp controller onto the local machine. Then the next time you run the Connect-NaController cmdlet the credentials you previously saved will be used. So how do we use this new feature, and why do you care? PowerShell: A note on Execution policy. While driving up to RTP today I was listening to the PowerScritpting podcast episode 140. Hal and Johnathan received a question about execution policy settings. The conclusion they reached was that remote signed was a good compromise. I would like to expand on this a bit. The real fear with script execution is that you’ll unintentionally run code that has malicious intent buried within it. Personally I don’t run around running code before I review and test it, but that doesn’t mean I’m safe. As PowerShell MVP and trainer extraordinaire Don Jones has previously stated the risk is with your profile. Read morePowerShell: A note on Execution policy. PowerCLI: Why you need this book! 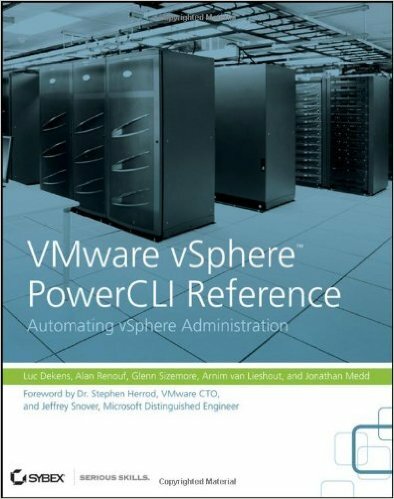 The VMware vSphere PowerCLI Reference will officially go on sale April 12th, and if your a vSphere administrator this one is a must have. We gathered the collective automation experience of four vEXPERTS and a MVP, and then filtered it through a fifth vEXPERT. The end result was a collection of polished solutions that are not only technically proficient, but more importantly will work the first time every time! Having all built and maintained large infrastructures we combined our collective knowledge and wrote a complete reference, we cover the entire life cycle from creating your environment to monitoring it long term. I mean it, we left no stone unturned where VMware had no PowerCLI solution we wrote our own. This book includes a PowerShell Module with 79 custom advanced functions! We also considered how you would use our book, and chose to take a task driven approach, this enabled you to just flip to the answer you need. You don’t have to “read” all 780 pages… instead think of this book as a fire extinguisher for your virtual infrastructure. So that’s great, but who needs a book? With blogs and the community forums you can just find the answer right? Yes, yes you can eventually, but if you do that your shopping at a fishery. In this book we WILL teach you to fish! As a commitment to that end we created a dedicated web site to support our work. If you find a bug, or if we missed something you can post a question in our forum! Admittedly this is my first published work, but I couldn’t be prouder of it. In my opinion The ONYX, and vSphere SDK chapters alone would be worth the cover price. I look forward to the release, and to your honest opinions of our work!